Are The Stone Roses resurrecting for 2009? Mani: "Ian Brown just needs working on"
Former Stone Rose, current Primal Scream and all-round 'madferrit' bassist Mani has pledged to get his old band back together next year. 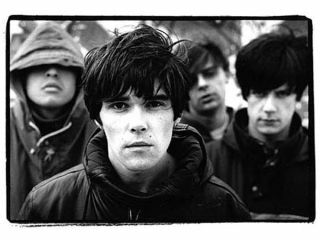 March 2009 marks the 20th Anniversary of The Stone Roses' self-titled debut album, an ideal opportunity for a special edition reissue (of course) and, if Mani is to be believed, a reunion tour. Original drummer Reni was the first to leave the line-up in 1995, but it was only after guitarist John Squire quit a year later that The Stone Roses finally disbanded. It's common knowledge that frontman Ian Brown and Squire don't exactly see eye-to-eye, and have had no contact since the split. It's this relationship (or lack of) that has made a reformation so unlikely. "Me, John and Reni are up for doing it and Ian just needs some working on," Mani told The Sun. "Next year is the 20th anniversary of the first album. It's the ideal time to do it. It's something I would love to do before we are all fat and bald. Start the campaign." It's surprising to hear that John Squire is involved. After working solidly as an artist since 2004, the guitarist told Manchester Evening News "I'm enjoying this far too much to go back to music." And when asked about a Stone Roses reunion, he said it was "highly unlikely."